For convenience’s sake, nowadays users tend to store their confidential and personal data into a portable flash drive to be carried around. With this tiny device of course you can save the hassle of having to bring a bulky laptop with you. However, since the gadget is small, careless users could easily misplace it somewhere or drop it without knowing. If this happens, it will be disastrous especially if the flash drive contains some important and confidential data which you do not have backup for. 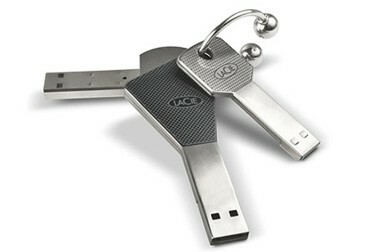 An easy solution for absent minded people, a key-shaped USD drive has been introduced by LaCie which allows users to hook it onto a key ring together with users’ house keys, office keys or car keys. When hooked to a bundle of keys, it minimize the chances of misplacing or losing the flash drive. The LaCie’s iamaKey USB flash drive, besides having the advantage as mentioned, also features a super-durable protection shield using LaCie’s Gold SIP technology which protects the drive from water and scratches. Two models are currently available, iamaKey 4GB and iamaKey 8GB. The 4-gigabyte iamaKey flash drive costs $18 while the 8-gigabyte one costs $28. The transfer rate is up to 30 megabytes a second in read mode and up to 10 megabytes a second in write mode.